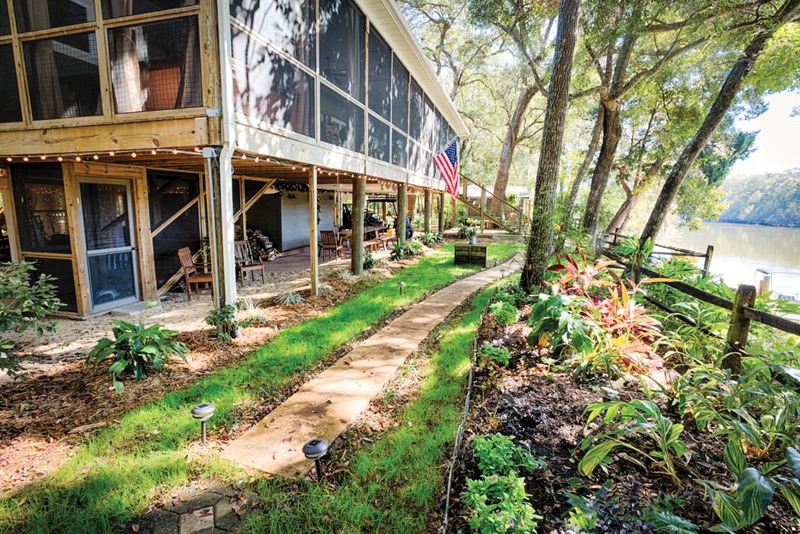 Off a lonely dirt road in a remote wilderness, tucked away from the tourist trappings so common to Florida, the Choctaw Lodge Bed and Breakfast Retreat lures travelers to the banks of the Choctawhatchee River, to a Florida few people have ever seen or even heard about. It’s the kind of unspoiled oasis nature lovers scour websites longing to find, devour travel articles and guidebooks in pursuit of, and question fellow explorers to learn about. It’s what owners Ron and Kathryn Hardy delight in sharing with others who treasure nature and wish to preserve it like they do. Freed from commercialism, the soul of Old Florida emerges from the river and tens of thousands of acres of conservation land surrounding it. 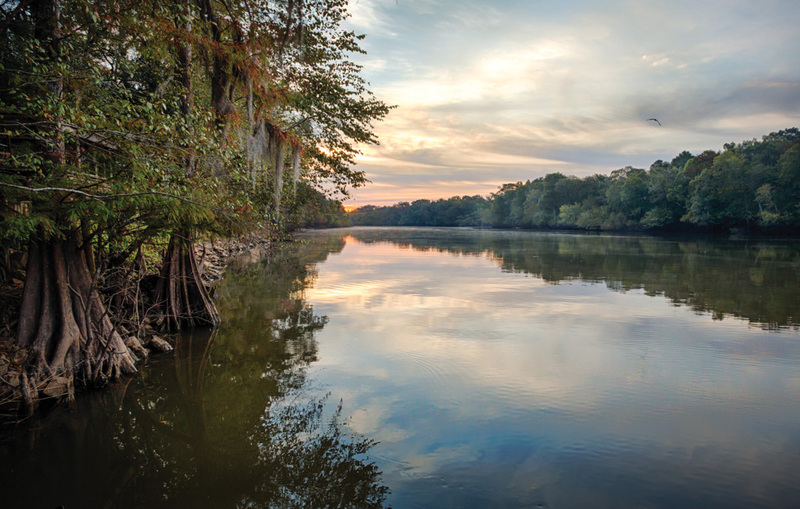 Ron and Kathryn understand how these children feel, for both grew up on rivers that nourished them as places to play and dream; Ron on the Tensaw in the Mobile River Delta and Kathryn on the Ocmulgee in Georgia. Even when they moved to Panama City Beach, river life flowed through their consciousness as a longing to return. “One day at the local feed store, we noticed a note scribbled on an index card advertising river property for sale and decided to take a look. I knew we were meant to buy it when I asked the real estate agent if my favorite bird, the hawk, ever came around. At the exact moment she told us, ‘We seldom see any,’ one circled directly above our heads,” says Kathryn with a smile. On weekend getaways they lived in a single-wide trailer that came with the property. They kept returning, staying longer each time, until Kathryn finally said, “If you build me a closet, I’ll stay out here full time.” They built their dream house, which is now also used as the main lodge, and later added the two houses that became available during the building process. They planned to live in the main house and use the other two for visiting friends and relatives until two photographers showed up to research a book. 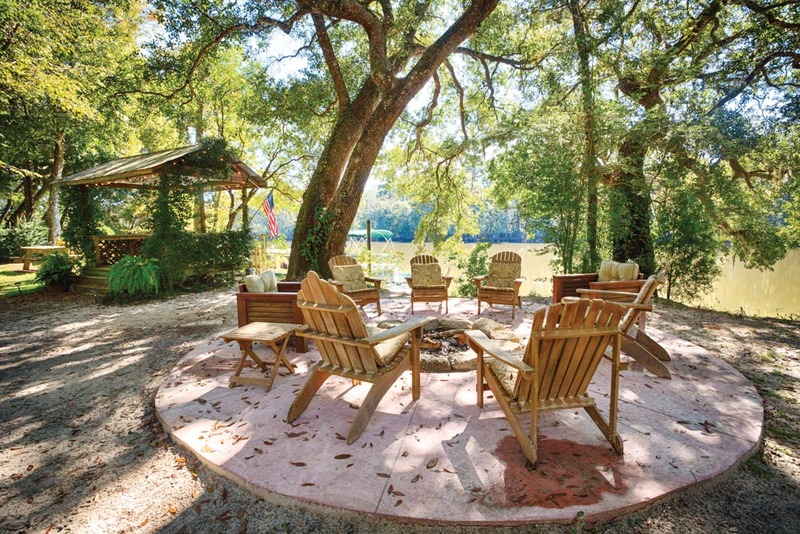 John Moran and David Moynahan (Moynahan’s inspiring photographs appear on these pages) suggested they transform their property into a bed and breakfast retreat for others to glimpse the wonders of fast-disappearing Florida nature. A luxurious retreat in the midst of wilderness recalls lodgings found in another landscape that has shaped their lives: the elegant safari camps scattered across the African savannas, where wild animals roam free. This will be their seventh year of escorting groups there, where strangely enough, Kathryn feels at home. “In Africa I feel closest to the river, and here I feel closest to Africa,” Kathryn shares. “They feel intertwined to us somehow.” Traces of Africa decorate the interior of the lodge: tall ebony statues and black-and-white sketches of elephants and indigenous people displayed on the white walls. Some were drawn by native artists and others by Kathryn, a trained artist. She adds bright colors with a framed collection of beaded tribal jewelry along with photos taken by Ron. 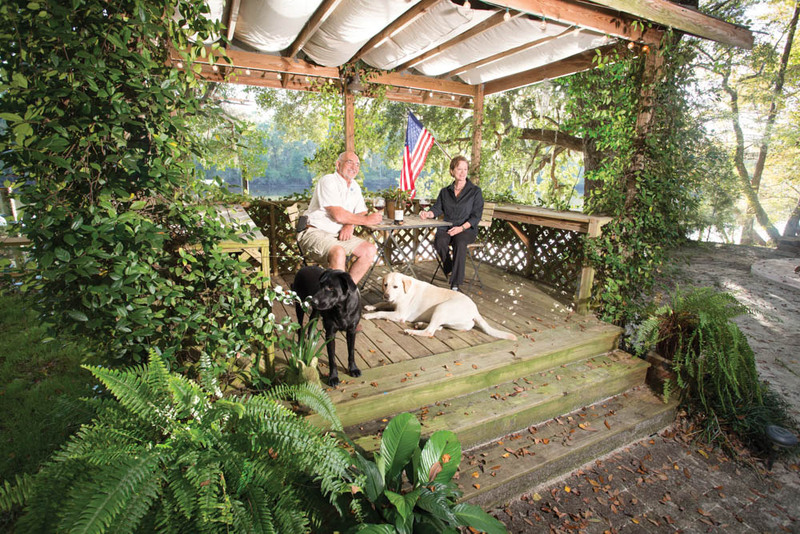 Kathryn and Ron appear to have incorporated elements of their natural surroundings into the design of their spacious main lodge. Kathryn used her artistic sensibilities to bring the outdoors in, to replicate the perfection and harmony she finds in nature, and to create the thinnest possible boundary between nature and the indoors. Lofty ceilings soar high overhead like the hawk Kathryn so loves to watch gliding across a cloudless sky. 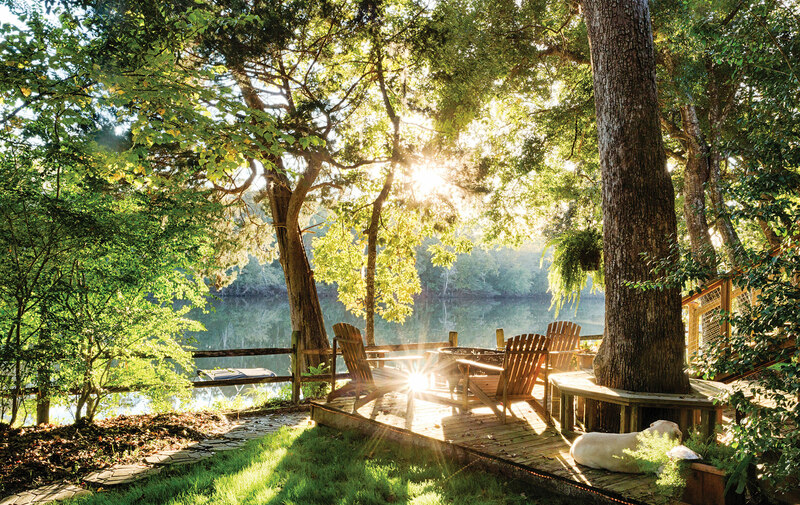 Extending across the width of the lodge, a screened porch is as spacious and clutter-free as the river seen from it. Massive stone fireplaces both on the porch and inside anchor the design in much the same way as the expansive roots of a majestic bald cypress bind the towering tree to earth. A large Lab and a frisky black puppy bring life and vitality to the tranquil scene, making you want to plop down on one of the comfy couches, pet the dogs, and stare at the river for hours. Guests are pampered from the moment they arrive until they pack up and drive off. 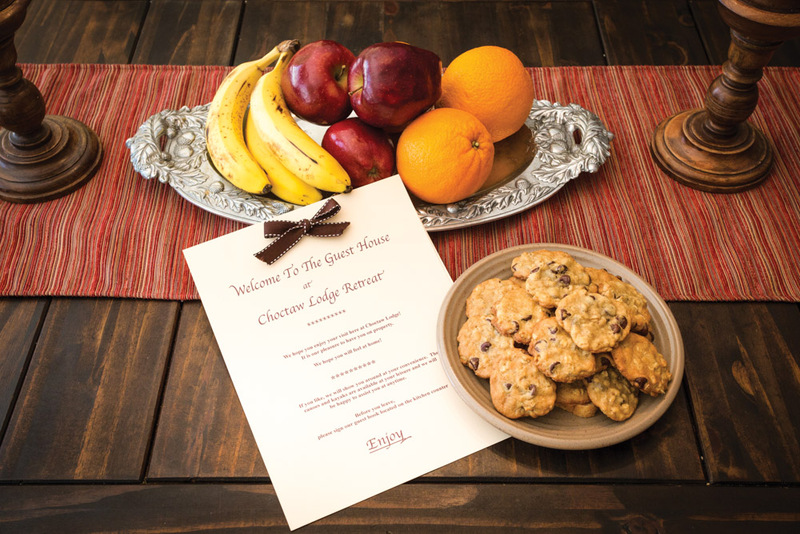 Upon check-in, they are welcomed with warm homemade cookies and fresh fruit and then led to one of the two cottages stocked with soft drinks and coffee. The Guest House is a more formal European-style two-bedroom cottage with dark, glossy wood furniture and a leather couch. Decorated in earthy tones, the rooms are as soothing and restful as the river on a cloudy day. 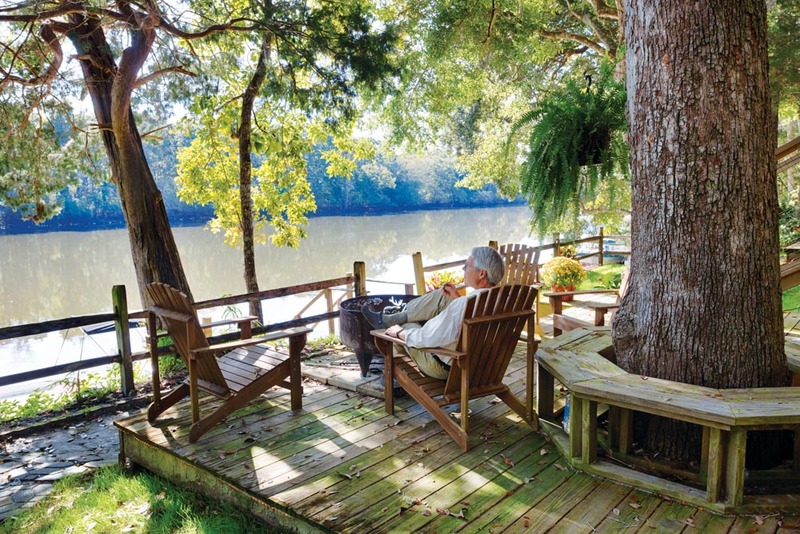 An antique swing and wicker furniture provide seating for gazing upon the river from a screened-in front porch, while cushioned window seats piled with pillows offer views from large dining room windows. The Boat House is an elegant interpretation of fish camps common to rivers. It’s a more laid-back two-bedroom cabin with couches and chairs covered in plaid cotton where you can kick off your shoes and curl up in front of a stone fireplace or read a book selected from the bookshelves lining one wall. Start the day with a sumptuous complimentary breakfast. 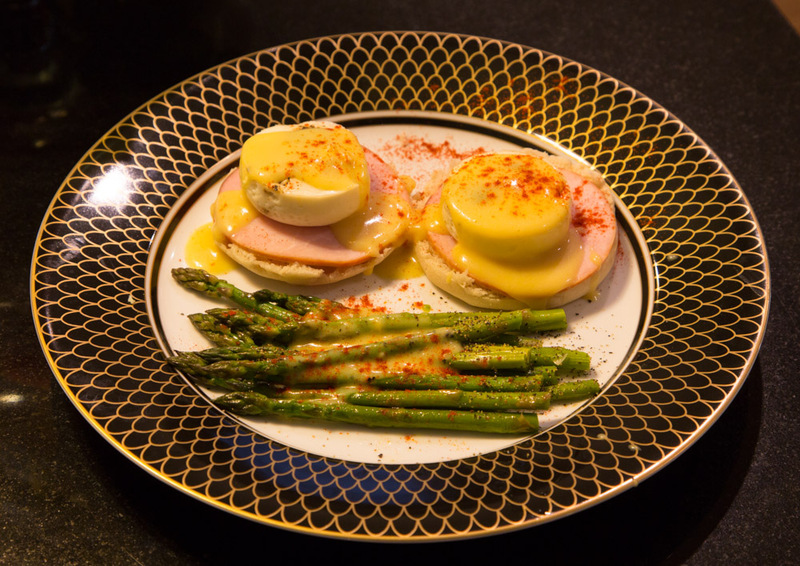 The kitchen specializes in gourmet cuisine with a Southern accent, such as sweet potato pancakes and maple syrup and the Sunday brunch hit, steak and eggs Benedict with cinnamon raisin toast and a cheesy hash brown potato casserole, both served with fresh fruit. Teatime is every afternoon from two to three, where the dessert of the day—an item such as eggnog bread pudding or Miss Jimmie’s homemade pound cake—tempts guests and is served along with tea, coffee, lemonade, and soft drinks. Picnic lunches can be arranged for day trips. Like many quality ecotourism lodges, Choctaw Lodge is convenient to other outstanding natural attractions that expand outdoor recreation. The lodge is located in a Northwest Florida region described as a “biological hotspot” for its unique and rare biodiversity. Visit the famed E.O. Wilson Biophilia Center only seven miles away to learn more about what you’ll encounter. Pine Log—Florida’s oldest state forest—is laced with hiking trails, while the Florida National Scenic Trail takes hikers across bluffs overlooking the clear spring-fed waters of Econfina Creek. Paddle closer to these crystalline springs in a canoe or kayak rented from a local outfitter. Stop by Pitt Spring for a picnic lunch, and read all about the Native Americans and early settlers at an interpretive display set up by the Northwest Florida Water Management District. Ron and Kathryn have not exactly lived humdrum lives, yet nothing beats the satisfaction they find living by the river. Kathryn thrived in the fast-paced, competitive world of fashion design, where her considerable talents attracted such legendary designers as Bill Blass, who mentored her career in places such as Palm Beach. Ron has owned Gulf World Marine Park in Panama City, Florida, for over thirty years. He is busy now coordinating the park’s stranding network, the Southeast’s largest rescue and rehabilitation of marine creatures including dolphins and whales. 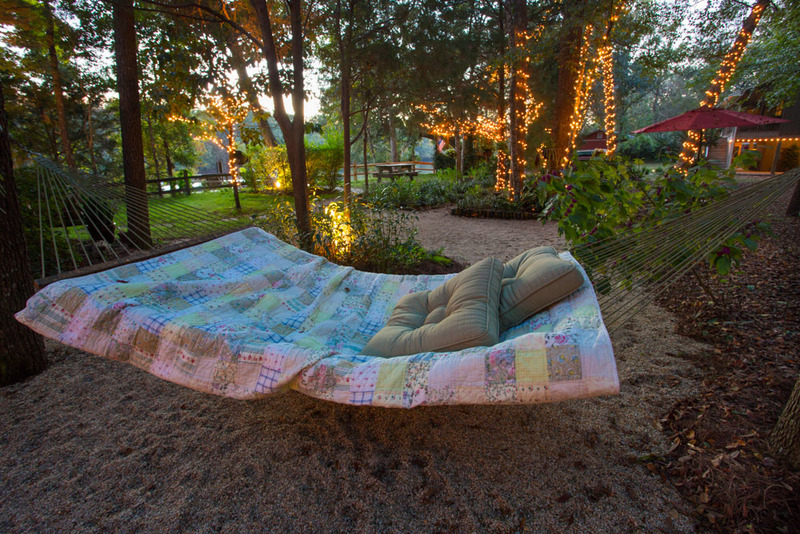 This couple brought luxury to the wilderness but discovered that wilderness is the true luxury. They learned that after a while, the boundaries between the outdoors and the inside blur and eventually vanish, until before long you are enveloped in one glorious and all-encompassing whole. They discovered the river is not only a place to dream and play but also a perfect place to retreat beside quiet flowing waters that refresh spirits and restore souls. To make reservations and learn more, visit www.choctawlodgeretreat.com or call (850) 835-1784. The lodge is conveniently located between Ebro and Freeport, Florida, off Highway 20—only thirty minutes from Panama City Beach and thirty-five minutes from the Santa Rosa Beach/Destin area. Contact them for more detailed directions.